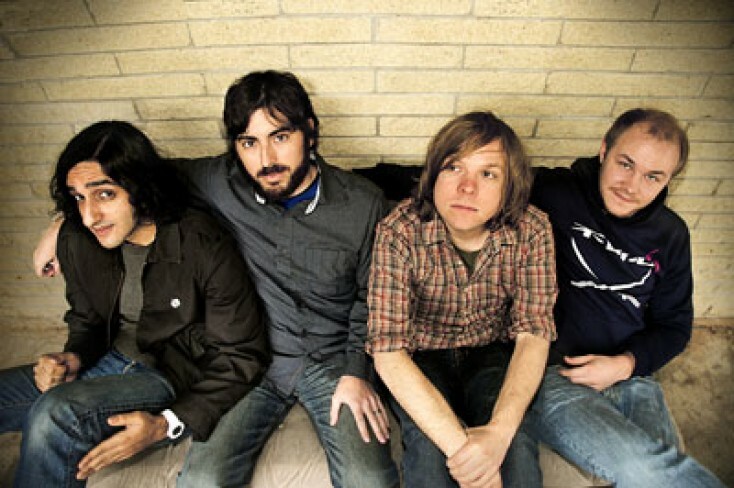 Explosions in the Sky played the Fillmore on September 13th; we sat down with Chris Hrasky to talk about music and the current tour. Check them out live or pick up a copy of their new CD Take Care, Take Care, Take Care. MWN: Tell us about the new album, some really cool artwork and great tracks, are there any songs you are especially proud of? Chris Hrasky: As far as the CD/Album cover, we were talking about how to incorporate the idea of a house, how the Album folded into a house, we were excited by the idea of offering it to people who actually buy a CD at a store and don’t just download a copy. We wanted it to be memorable and have the artwork have a cool effect. The first and the last songs are the strongest in my eyes. MWN: What do you guys enjoy doing outside the world of music. Chris Hrasky: It just depends, myself and one of the other guys is married I like to spend time with my wife and dogs and go hiking. MWN: Where is your favorite place to hike? Chris Hrasky: My parents live in Montana. The terrain in Montana is amazing, I live in Texas, it has nice areas too to hike, but Montana is pretty cool it has way more hiking terrain that Texas; I really enjoy exploring when I am there. Checkout concert photos of Explosion in the Sky in Denver, Colorado. MWN: You have had your music as soundtracks to various projects, is there anything you work will be on in the near future or are you currently working on anything? Chris Hrasky: Not really, there is always a possibility, we are not currently working on anything, but that might be something in the next year or two, we are currently locked into touring mode. When we tour we try to stay focused on that. MWN: Being an instrumental band, are there any vocalist you’d love to work with? Chris Hrasky: To be honest, we grew up listening to vocal music; there are too many great singers to list. But I’d love to work with Thom Yorke of Radiohead, which would be really cool. MWN: How has the recording/musical process evolved for you guys over the years? Chris Hrasky: It takes us much longer now to record a CD, I’m not sure if we are more critical since we’ve played together for so long. We have gotten critical and we don’t record many of the songs we play together. We take our time a bit more and put my effort in to it. We make sure that the songs we choose for the album are the one we think are the best. MWN: Tell us about the current tour, any places you have played that you were excited about. Chris Hrasky: There are a handful of cites we have never played before, we haven’t played Albuquerque before, I have friends and family there so that will be cool. You never get a good sense on tour it’s a bit of a world-wind. It’s very strange, you check in and do sound check you play the show and you gone in 12 hours. So you don’t really get to see much of each city. MWN: What other bands are on tour with you doing this tour? Chris Hrasky: Twin Sisters are playing with us on the first half of the tour; I think they are from New York. The Antlers are playing some gigs with us, as well and Wye Oak from New York are on the second half of the tour. We are playing a couple gigs with Death Cab for Cutie, and The Drift are playing with us on our European Tour in the fall. MWN: What musicians currently inspire you. Chris Hrasky: It weird, when I am on tour I don’t listen to a whole lot of music. I go in phases where I don’t listen to a whole lot of music. MWN: You have toured with Fugazi, and Smashing Pumpkins, any cool stories or experiences you would like to share? Chris Hrasky: We only played a couple shows with Fugazi and that was a huge deal at the time that was a high point, we had only been together for a few years at that point. They are a band I still listen to, and they still inspire me. We also did a tour with the Flaming Lips and that was pretty amazing, musically it was amazing the way they conduct themselves and they are hardworking guys that respect people and that isn’t always the case in this business. MWN: Any causes or issues you want to talk about? Chris Hrasky: We are a band that tries not to get on a soapbox, we are no smarter that anyone else. MWN: Is there anything different you are doing on this tour? Chris Hrasky: I don’t know if we are doing anything bigger, but many of the venues are bigger on this tour. Hopefully it will work out, I guess we’ll see.